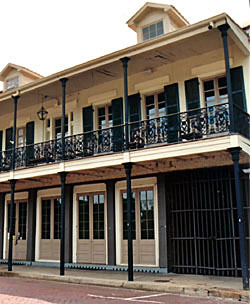 The Ducournau Building is an authentic example of French Creole mercantile architecture, which is rarely seen outside of New Orleans. The building has the trademark two-story front porch with cast iron ornamentation that epitomizes buildings in New Orleans’ French Quarter. It also has a carriageway connecting the rear courtyard to the street. This is seen in only one other building in Natchitoches. The Ducournau Building was built sometime between 1820 and 1847. During this period, the land was owned by a businessman named Francois LaFonte, who erected the building to serve as both a store and a residence. LaFonte sold the business in 1847, and over the next few decades the building traded hands numerous times. In 1881, the building was acquired by J. A. Ducournau, for whom it is currently named. An iron nameplate located in the sidewalk in front of the building bears his name. The building remained in the Ducournau family for nearly a century. It suffered a fire sometime prior to 1977, which did extensive damage to the interior of the building. Following the fire, the Ducournau family sold the building to Robert Smith and James Hearron in 1977. They renovated the building, changing a few minor external features as well as the internal layout. Despite these changes, the building was restored to its previous functions as a store on the bottom floor and a townhouse on the second floor. 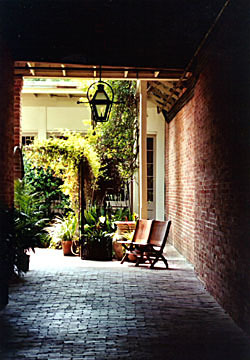 Today, Ducournau Square, as the building’s courtyard has come to be known, is one of the most scenic locations in the Natchitoches Historic District. The courtyard contains a small garden, a fountain and a restaurant. The Ducournau Building is located between 744-748 Front St. within the boundaries of the Natchitoches Historic District. It is now a restaurant and a bed and breakfast; call 318-352-1774 for further information. The Ducournau Building has also been documented by the Historic American Buildings Survey.